There is no doubt that remote controls are extremely popular and it has become very hard to imagine a world without them. They are used to control all manner of house appliances like the TV set, the stereo, the VCR, and the satellite receiver. Whenever such an appliance reaches the end of its lifetime its remote control becomes obsolete. 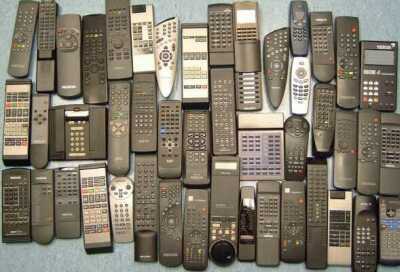 And since wasting it is a shame we probably all have some old remote controls lying around somewhere. Wouldn't it be nice to be able to use them again to control other things, like for instance the lights in the living room or the curtains? But sometimes it is the other way around and it is the remote control that dies first. After all it is a hand held device which is often dropped to the floor. Some even have a drinking problem, when someone spills some sort of beverage over it. Others become a victim of jaws of man's best friend. This corner of my site is going to cover my smaller sized Infra Red based remote control projects. These projects will vary from very easy testers to a complete IR receivers which can be used to control all manner of things. Only time will tell what is going to be covered here, so please do come back regularly if you're interested in this subject. If you want to learn about the theory of operation of IR remote controls you may want to visit my knowledge base first. There I explain the basic principles of IR remote controls.